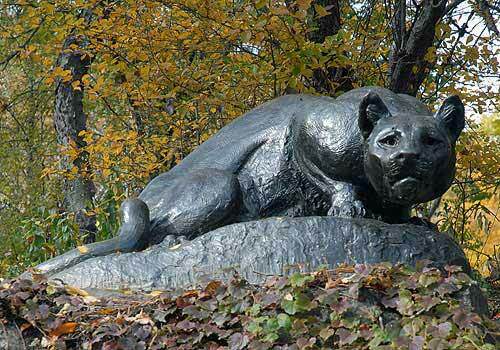 Situated on a rock outcrop on the west side of the East Drive at the edge of the Ramble, the crouching bronze panther has scared many joggers as they approach this life-size and realistic representation. Still Hunt was created by Edward Kemeys, the noted American sculptor who also created the famous Hudson Bay wolves at the Philadelphia Zoo, and lions at the entrance to the Art Institute of Chicago, Unlike the traditional sculptures of other animals in the Park that sit on a base or pedestal, Kemeys situated his animal directly atop the ledge of the rock. Kemeys was so interested in depicting his animals in a realistic mode that he traveled to the western states to see them in their native habitat. Kemeys got his start as a sculptor when he worked as an axe-man building Central Park. One day he saw a sculptor at the Zoo who was modeling the head of a wolf and Kemeys became inspired. West side of East Drive, mid-Park at 76th Street.